"McLean’s book should be a must read for those responsible for medical education...so that in the end the human connection between healers and those they heal is enhanced." Cheryl L. McLean M.A. (University of Western Ontario, London, Social Sciences,M.A. Concordia University, Montreal, Faculty of Fine Art, Creative Arts Therapies) from London, Ontario is an educator, writer and publisher, editor, arts based researcher and therapist/ ethnodramatist and was recently awarded a Harrison McCain Visiting Professorship award at Acadia University, Nova Scotia (July to Sept. 2015). She is founder and Executive Editor of The International Journal of The Creative Arts in Interdisciplinary Practice IJCAIP and Editor of The CAIP Research Series and books,"Creative Arts in Humane Medicine"(2014) and "Creative Arts in Interdisciplinary Practice Inquiries for Hope and Change" (2010) and "Creative Arts in Research for Community and Cultural Change" (2011) with Associate Editor, Dr. Robert Kelly, University of Calgary, published by Brush Education, Edmonton. As a writer her essays and other provocative writings about modern living, change and survival have been published in "The London Free Press", "The Toronto Star" and in original plays written and produced for solo ethnodramatic performances performed for academic and professional audiences. A leader in the field of creative arts in interdisciplinary practice, she has written about her approaches and creative methodologies in numerous publications and journals see (McLean, C.L. (2015) The Advancement of the Creative Arts in Interdisciplinary Practice, Cheryl L. McLean, pg. 149-151, Volume 12, #2, Journal of Curriculum and Pedagogy, Routledge, Taylor & Francis Group, http://www.tandfonline.com/doi/full/10.1080/15505170.2015.1055403) and in the published series Creative Arts in Interdisciplinary Practice, Creative Arts for Community and Cultural Change and Creative Arts in Humane Medicine/ Brush Education, Edmonton. She has presented keynotes and original plays/solo performances related to personal stories and health across Canada and in the U.S.
(among the organizations: Alberta Psychiatric Association; UBC/Okanagan; McGill Medical School; Congress of the Humanities/University of Western Ontario; Lakehead University and many others). Cheryl McLean published The International Journal of The Creative Arts in Interdisciplinary Practice IJCAIP for over six years working with a stellar Advisory Board made up of leaders in the arts and education, social sciences, medicine, business, research and design. The International Journal of The Creative Arts in Interdisciplinary Practice IJCAIP was an academic open access journal accessible to researchers, educators and students in over 15,000 libraries in 60 countries around the world including developing nations. 'Many of the stories I heard in this community and on our walks together related to major life changes experienced by women and men in late mid life and how most in his or her own way were dealing with challenge and change and taking creative steps transitioning on not only surviving but thriving. The idea to record and share some of these community based stories to help foster hope and resilience led to a new concept for a proposed book project...aptly called "The Walkers". The purpose is to share stories and experiences with others at home and beyond so that we might help readers deal with the inevitable changes they too might be facing in this special chapter of their lives. Our stories will resonate as true experiential accounts offering hope and encouragement for others." In March 2014 she presented a keynote address for the Alberta Psychiatric Association 2014 Scientific Conference and Annual General Meeting,Living Stories for Hope and Change sponsored by the Alberta Physician and Family Support Program (PFSP) featuring research and stories about the creative arts in research and action in mental health and in physician wellness. In July 2014 she presented the keynote address, Navigating Tides of Challenge and Change through The Creative Arts in Research and Practice at Acadia University, School of Education for 200 students and faculty. She has been invited to present keynotes, lectures and workshops for universities and health organizations in Canada and the U.S.
Acadia University, School of Nutrition, Lecture/presentation, The Arts and Nutrition Education, September 22, 2015. Acadia University Summer Institute Conference 2014, Keynote speaker, "Navigating Tides of Challenge and Change with Creative Arts in Research and Practice", July 4, 2014. Alberta Psychiatric Association 2014 Scientific Conference, Keynote speaker, "Living Stories of Hope and Change" Rimrock Resort Hotel, Banff Alberta, March 27 - 30, 2014. American Medical Students Association AMSA Medical Humanities Scholars' Program, Guest facilitator, Webinar, Perceptions of Physicians in Literature and the Arts: Arts Alive and Thriving in Medical Education, March 21, 2013. Acadia University, Wolfville, Nova Scotia, "A new Pond of Interdisciplinary Opportunity, The Creative Arts in Interdisciplinary Research, Keynote Address, Arts Based Research Network (Faculties of Arts, Professional Studies and Science), October 5, 2012. McLean, C.L. (2014), Remember me for birds, An ethnodrama about aging, mental health and autonomy (pg. 14 - 38) in C.L. McLean (Ed. ), Creative Arts in Humane Medicine, Brush Education. March, Banff, Alberta Psychiatric Assn. July 2 - 18 Acadia University, Wolfville N.S. July 2015, Acadia University, Wolfville N.S. September 2015, Acadia University, Wolfville N.S. November 2015, Harrison McCain Foundation, Toronto, Ont. * In addition to travel in her work and teaching Cheryl has also traveled extensively throughout Canada and abroad and recently returned from a month in Malta acting as a travel host for Merit Travel. Working as a couple hosting team with her husband Don they joined 12 Canadians exploring Malta and surrounding islands. "Using the arts to teach and stimulate empathy contributors argue for training in empathy in medical schools as an essential tool in patient care. 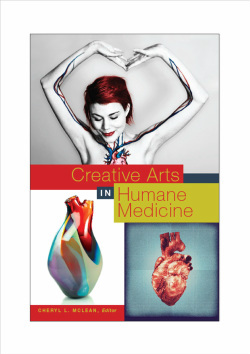 Creative Arts in Humane Medicine is a reference book for medical educators. The book contains many interesting ideas for those who wish to both enliven and deepen their teaching of undergraduates... makes a strong case for broadening the base from which we as medical professionals live and work." "Creative Arts In Humane Medicine" takes us on a fascinating journey to meet educators, clinicians, support workers and artists all of whom have created an innovation around applying arts-based methods to enhance patient care, reflexivity in learners and a sense of community and wellbeing in practitioners. . The book’s emphasis on multiple media (theater, music, visual and digital imagery, literature and reflective writing) is a strength as is its inclusion of international and interprofessional perspectives. Creative Arts does much to advance the scholarly credibility of the health humanities while skilfully promoting the humanistic imperative for learning, teaching and healing using both sides of the brain." expression and arts-based methods to the field of healthcare." dependent on psychology, sociology, philosophy, law and human creativity. those they heal is enhanced." "This publication calls attention to a wide range of situations in which art forms might be educational or therapeutically helpful..."Creative Arts in Humane Medicine" may serve an important role in stimulating further interest and research in this field." "All submissions incorporated extensive literature reviews, which will well serve the reader who wishes to delve more thoroughly into specific content. Several entries discussed the evolution of the medical humanities in medical education........McLean's new book is for all those interested in healthcare and the arts... The integration of the arts into health care professional education remains a marginalized field, but best practices in this field abound." "Cheryl was the keynote speaker for the Arts-based Research Symposium I was involved in organizing at Acadia University in October 2012. Cheryl's keynote address touched a diverse audience of students, faculty, staff, administrators and community members. I still hear comments about how accessible and inspiring her talk was. Cheryl even stayed throughout the symposium and offered us her thoughts at the closing. We were so privileged to have her with us. She is as generous as she is enthusiatic. " "Ms McLean's (keynote) presentation ("Living Stories of Hope and Change") addressed two questions: How Can I use the creative arts to support my personal wellness?, How do the creative arts in medicine help practitioners enhance clinical and relational skills? She answered those questions in a multifaceted presentation that began with a dramatic reminiscence honoring the memory of her mother, a psychiatric nurse. Her references to the burgeoning literature about the dynamic and sometimes controversial, presence of the humanities in health care complemented the performance aspects of her presentation. For Ms. McLean, the arts and the humanities provide practitioners with a rich means to discover and re-discover the nature of healing—of our patients and ourselves." 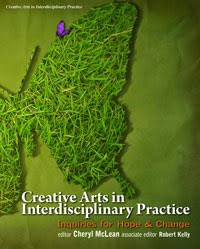 Creative Arts in Interdisciplinary Practice Inquiries for Hope and Change (editor Cheryl McLean, Publisher of The International Journal of The Creative Arts in Interdisciplinary Practice, associate editor, Robert Kelly, Associate Professor, Fine Art, University of Calgary) is a project of IJCAIP, The International Journal of The Creative Arts in Interdisciplinary Practice, and is published by Detselig Temeron Books, Calgary. First hand topical accounts are featured from leading academics, health researchers, nurse educators, physicians, educators, environmentalists, artists and others who actively use the creative arts in interdisciplinary practice in cutting edged research and in methodologies for health, hope and change. Readers will discover how the creative arts in interdisciplinary practice can re-illuminate the human story, stage human vulnerability, foster citizenship and give voice to narratives of human experience. This is a contemporary book that asks questions seeking vital solutions to the most critical social crises of our times while sharing courageous accounts of life and personal transformation..stories of hope and change." C. L. McLean from the research based solo performance "Remember Me for Birds" an ethnodrama about aging, mental health and autonomy.